Complementing its high rankings in the latest editions of various college guides, Thomas Aquinas College has earned a spot among the nation’s top colleges and universities, according to Washington Monthly. The magazine, which rates schools “based on what they are doing for the country,” considered some 1,739 colleges and universities nationwide for its 2018 list. Thomas Aquinas College ranks in the top 100 of the magazine’s list of liberal arts College’s, at no 69. The College also ranks at No. 34 on the magazine’s list of schools that offer the “Best Bang for the Buck” in the Western United States. 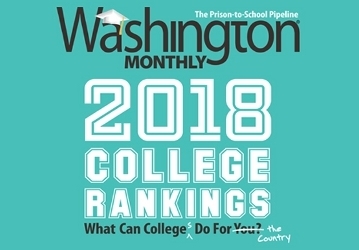 Whereas most college guides rely on “crude and easily manipulated measures of wealth, exclusivity, and prestige to evaluate schools,” Washington Monthly’s editors argue, theirs aims for a more noble measure: “contribution to the public good.” To that end, Washington Monthly considers three equally weighted criteria in compiling its rankings: social mobility (the extent to which schools recruit and graduate low-income students), service (encouraging students to contribute meaningfully to their communities), and research (professors’ scholarly contributions to their academic fields). Thomas Aquinas College has a long-established reputation for “social mobility,” which Washington Monthly’s Robert Kelchen has defined as “the extent to which [schools] charge students who aren’t rich a reasonable price for quality education that will advance them in their careers.” Committed, since its founding, to never turning away qualified students on the basis of financial need, the College offers a robust financial aid program that supports some 80 percent of its student body. By God’s grace and thanks to the generous benefactors who make this program possible, students graduate from Thomas Aquinas College with, on average, nearly half the educational debt of their peers at other private colleges and universities, and significantly less, even, than most graduates of public institutions. As for service, some 10 percent of Thomas Aquinas College students enter the priesthood or religious life. Roughly one-third, eager to share the gifts of their classical liberal education, become teachers, at all levels, from kindergarten to graduate school. Others still pursue careers in law, medicine, media, public service, or numerous other fields, with an eye toward serving the public good. The College’s graduates also often marry and go on to have fruitful, faithful families that contribute to their communities in myriad ways.